Relief Line is your not-so-serious look at the city we love. After five years of financial difficulties, it was recently announced that Toronto’s very own Trump Tower is up for sale. The future of the building is unclear, but rumours are that new ownership will likely make some changes, including ditching the name. Apparently very few people in this city want to be associated with the incoming president and his folksy brand of garbled, crypto-fascism. But rather than giving up on Trump Tower, Torontoist has come up with a list of unique and creative ways we can re-purpose it while still paying homage to the 45th President. Before anything else, we should honour the inauguration tomorrow with a big, spectacular demolition of the Trump International Tower and Hotel sign. Something like this to really light up the sky! Use the site to build a very impressive, world class urinal. The largest urinal ever. No one will have seen a urinal this great. It’s going to be gold and everything. It’ll be an absolutely huge urinal. This urinal is going to attract the biggest crowds you’ve ever seen. Trust me. Establish The Putin-Trump International Centre for Friendship and Collusion. Convert the condo units into housing for Syrian refugees, turn the restaurant into a women’s shelter, and rename the building: Celebrity Apprentice Never Won an Emmy International Hotel and Tower. Use the land to build a monument to Trump similar to the John F. Kennedy Eternal Flame at Arlington National Cemetery, except it’s just a tire fire. Repurpose the brick and mortar from the tower into the foundations of a great wall on our porous southern border, before we’re overwhelmed by the mass of Americans fleeing north. Do nothing. Just leave the Trump Tower abandoned and neglected. Over time, it will slowly decay and fall apart, but we will just watch it fail. Soon moss will begin to cover the exterior and the cheap sheen of the gold lettering to fade. Next, the façade will crumble and reveal the hollow, rotting structure beneath it. When it finally collapses under its own the weight, in four to eight years’ time, we will all come together to clean it up and establish a nice, little parkette. To advertise the new president’s business acumen, we could put up an extremely large billboard of his 1995 Tax Return, highlighting his very impressive $900-million in losses. Establish The Toronto Institute for Hand Enlargement. Trump loves people of all faiths and backgrounds so it only makes sense that we use the land to house a large, downtown mosque. Naturally, some people have misgivings about having a large tower named after such an odious figure in the heart of our city. Who wants some right-wing, American, reality-TV-starring-blowhard with a dubious business record and pretensions of political office dominating our skyline? It’s embarrassing for us all. 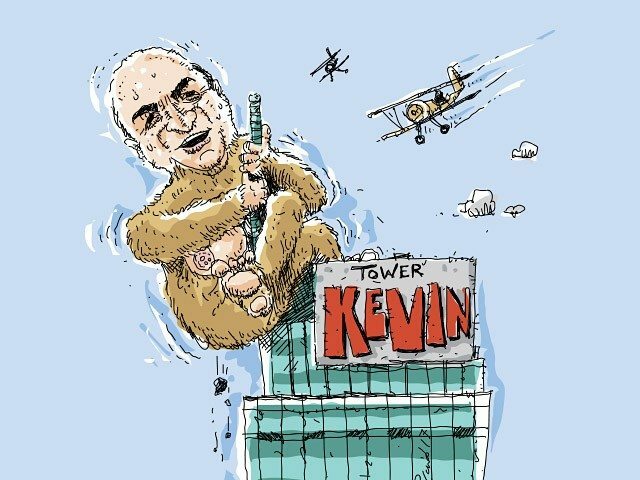 Instead I propose we keep it Canadian and re-christen the building The Kevin O’Leary International Hotel and Tower.